The Cretaceous Period is the final period of the Mesozoic Era. It covered the time span of 144 million years ago to 65 million years ago. There was a minor mass extinction at the end of the Jurassic Period that is the sign of the beginning of the Cretaceous. Many of the species of bivalved mollusks (similar to clams) became extinct at this time. The changes to the continents continued in the Cretaceous Period. Laurasia and Gondwana continued to move apart. 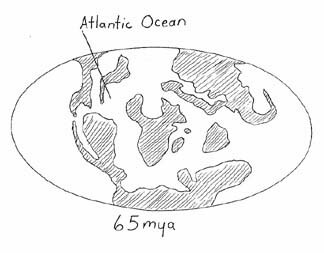 On the eastern side of Laurasia, the North Atlantic Ocean was formed. It covered the east coast of North America and most of western Europe. In Gondwana, South America and Africa broke apart. The ocean floor was spreading along a crack in the earth’s crust called a rift. This eventually led to the South Atlantic Ocean. Another rift on the eastern side of Africa caused a waterway between Africa and a body of land that contained modern Madagascar and India. The rift between Africa and South America created a long chain of volcanic mountains underwater. These mountains grew as the Atlantic Ocean got wider. As these mountains grew they displaced a tremendous amount of water. So much in fact that the water level of the seas was about 100 meters higher than today. This caused many inland seas to form. In North America, an inland sea divided the continent across the plains of modern-day Canada and the United States all the way to the Arctic Ocean. Animal life continued to develop much as it had in the Jurassic. New species of dinosaurs became important. 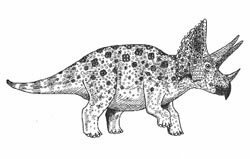 The ceratopsian dinosaurs appeared for the first time. These were plant-eating ornithischian, or bird-hipped, dinosaurs. The most famous example is the triceratops. It had three horns and a huge, bony frill that formed its skull. The most famous dinosaur of all, the Tyrannosaurus rex, finally came along during the end of the Mesozoic Era. Tyrannosaurus rex was a reptile-hipped dinosaur. It walked on two legs so is a theropod. All theropods were carnivorous. Sea life was not very different in the Cretaceous Period than in the Jurassic Period. There was neither a major extinction nor a huge burst of new species. There were many fish, mollusks, and arthropods to feed the giant sea reptiles that still lived in the Cretaceous Oceans. 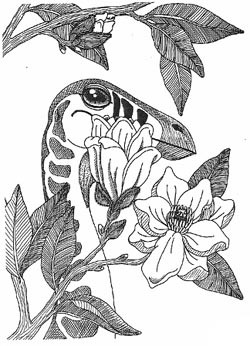 The most important development of the Cretaceous Period was the growth of flowering plants. Before this, most of the trees had been gymnosperms or plants with cones. Now trees began to produce flowers. 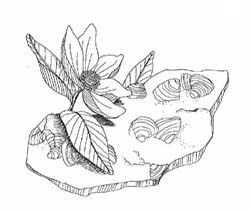 The ancestors of many modern tree species appeared during the Cretaceous including the magnolia and the maple. With flowers came many insects including butterflies, ants, termites and bees. While the flowering plants provided food for these insects, the insects made sure the pollen spread from flower to flower to produce the seeds that would keep the flowers reproducing. Mammals continued of course, but they were not very important. These were tiny creatures compared with the giant dinosaurs. The new placental mammals were an important evolution in mammal species. These mammals developed their offspring inside their bodies. The infant mammal was fed through an organ called the placenta. There seems to have been a major event that caused the mass extinction at the end of the Cretaceous Period. It is called the KT event for (K)Cretaceous and (T) Tertiary, the first period of the Cenozoic Era which follows. 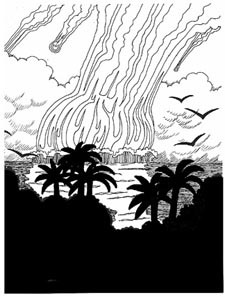 A popular theory is that a meteor hit the earth in the Gulf of Mexico off the Yucatan Peninsula. This caused many geologic activities. Volcanoes erupted. Clouds, smoke and dust covered the skies keeping the sun’s light away from the planet for years. This would have caused huge changes in the climate and vegetation. The KT event caused the extinction of more than 70 % of the species that lived in the oceans and 15% of the species on land. In fact, all land animal species over 50 pounds seem to have become extinct. Nearly all dinosaurs became extinct at this time. Modern birds, descendents of the dinosaurs, are all that remain of the animals that had ruled the planet for so many millions of years. In the seas, the ammonites and belemnites were wiped out along with the large marine reptiles including the icthyosaurs, plesiosaurs, and mosasaurs. Even though so much of the life of the Cretaceous Period had been hurt or eliminated, the species that survived were ready for the hard work ahead. The Cenozoic Era that follows is the time of the mammals. With the large reptiles out of the way, these small land animals were able to develop into many new and different species. It wouldn’t be long before it would be the mammals that ruled the earth.